FAYETTEVILLE, Ark. – Arkansas All-American and Outland Trophy winner Loyd Phillips has been selected for induction into the Texas Sports Hall of Fame this March. 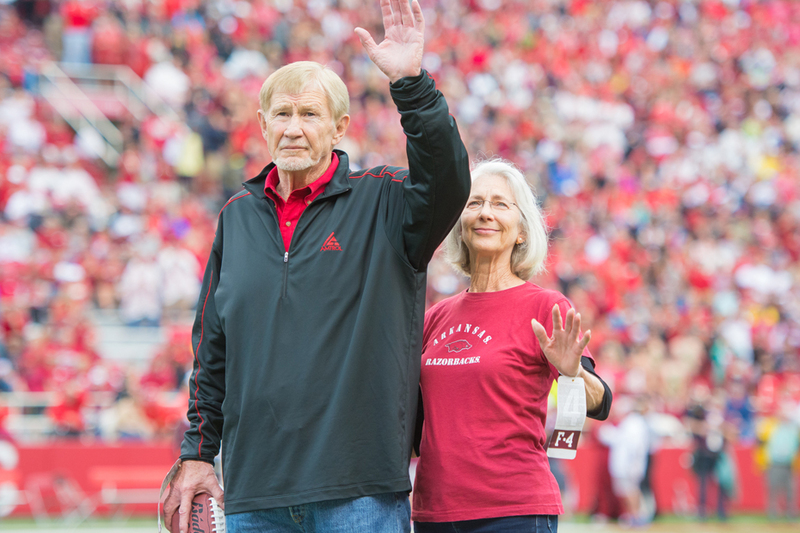 Phillips, who grew up in Longview Texas, was a consensus two-time All-American for the Razorbacks form 1964-66. He is one of only two Outland Trophy winners in school history (Bud Brooks). Phillips will be one of seven inductees honored at the Texas Sports Hall of Fame banquet on March 30. He will be joined by the family of former Tennis legend Maureen Connolly Brinker (deceased), former Houston Texas Wide Receiver Andre Johnson, former professional basketball star Nancy Lieberman, former Dallas Cowboys tight end Jason Witten, former University of Texas and MLB pitcher Greg Swindell and former Texas A&M and NFL kicker Tony Franklin. Loyd Phillips played defensive tackle for the Arkansas Razorbacks in the mid 1960’s and helped the Hogs win the National Championship in 1964. He was a two-time All American (1965 & 1966) and winner of the 1966 Outland Trophy, recognized as the country’s most outstanding interior lineman. Philips was a three-time All-Southwest Conference selection (1964-66). Phillips earned 304 career tackles (100 in 1965, 97 in 1966). He played on Razorback teams that compiled a 29-3 record from 1964-66 including a 11-0 1964 national championship season. He was a first-round draft choice of the Chicago Bears and also played for the New Orleans Saint during his NFL career. After pro football, Phillips returned to Arkansas to finish his degree in health education and obtained his master’s degree in administration. Phillips was inducted into the College Football Hall of Fame in 1992. He is also a member of the University of Arkansas All-Century team, the 1960s All-Decade Team, the University of Arkansas Sports Hall of Honor, the Arkansas Sports Hall of Fame and the Southwest Conference Hall of Fame. The class of 2019 Inductees into the Texas Sports Hall of Fame will be honored on Saturday, March 30 at 6 p.m. at the Waco Convention Center. Before the banquet, the Texas Sports Hall of Fame will host a reception at 4 p.m. Combination Reception and Banquet tickets can be purchased for $200 each or $1,400 for a reserved table of eight. Tickets for the banquet only can be purchased for $75 each or $600 for a reserved table of eight. To purchase tickets or for more information, call 800-567-9561 or visit http://www.tshof.org/buy-tickets/.